Pune witnessed a 3-day Cinematic Fragrances of Northeast. 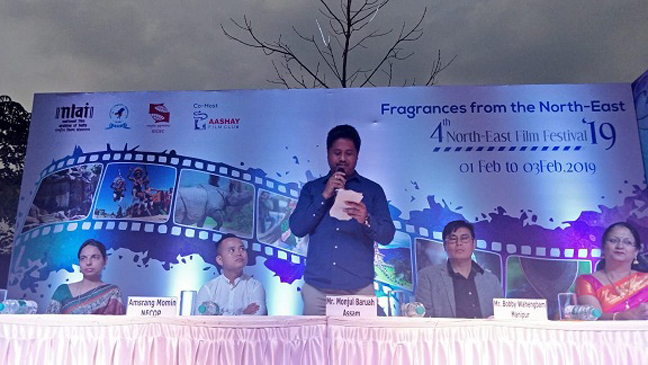 The National Film Archives of India (NFAI) and Symbiosis and Ishanya Cultural and Educational Centre(SICEC) in association with the North-Eastern Students and Cultural Association (NECOP) organized the fourth edition of the North East Film Festival from February 1 to 3. On February 1, the 4th North East Festival was inaugurated at Pune. Screenings were held at the NFAI Phase-2, Kothrud and Symbiosis-run ELTIS at Model Colony. Besides film screenings, food stalls featuring cuisine from all eight states and tourism promotion initiatives were set up at the venue. The festival featured a selection of fifteen films from the NE States. The opening film of the festival was Dominic Sangma’s Garo-language film ‘Ma. Ama’ and the festival closed with Rima Das’ Assamese film ‘Village Rockstars’, which was India’s official entry for Oscar. Amongst the invited guests of the film festival were Dominic Sangma, filmmaker Roopa Barua, and Monjul Baruah, who previously assisted filmmakers like Jahnu Barua. Roopa Barua made the documentary film ‘Daughters of Polo God’, which is based in Manipur, the birthplace of modern Polo. The film is also a part of the selection. Monjul Baruah recently made the film ‘Kaaneen’. Movie critic Bobby Wahengbam was also amongst the invited guests. Few of the screened movies were Manipuri film – ‘Ima Sabitri’, Mizo film – ‘Nuna Thar’, Khasi film – “Nabon” Nagamese film – “Nani Teri Morni” and others. People witnessed a colourful venue with food stalls from all the Northeastern States. The three-day programme had various cultural showcases of music and dance by individuals and groups from across the city.